Did you know Hispanic Americans make up the nations largest ethnic or racial minority. Hispanics make up 17.8 % of the nations total population with a median age of 29. 10.88 million estimated living in Texas alone! I am a Latina born and raised in Texas. Actually my family dates back to Texas roots all the way from my grandparents. I often have to remind people when they ask if I have family in Mexico that the border crossed us, not the other way around. Quite the irony in today’s political climate and messaging. In celebration of Hispanic Heritage Month I am highlighting Hispanic women who I find inspiring and added to the pride of our community. Frida was school at National Prepatory School in Mexico City where she became famous for her outspokenness and bravery. An event that forever changed Frida was a fatal bus accident which left her criticaly injured. She underwent a slow and painful recovery and it was this time she began teaching herself how to paint. Some of her notable paintings include Henry Ford Hospital (1932) which depicted her second miscarriage, The Two Fridas (1939) where she portrayed the unloved and loved versions of herself. The Broken Column (1944) which showed her spine as a being shattered and the medical procedures she has undergone without success to fix them. The Suicide of Dorothy Hale (1939) as a gift to Hale’s grieving mother. 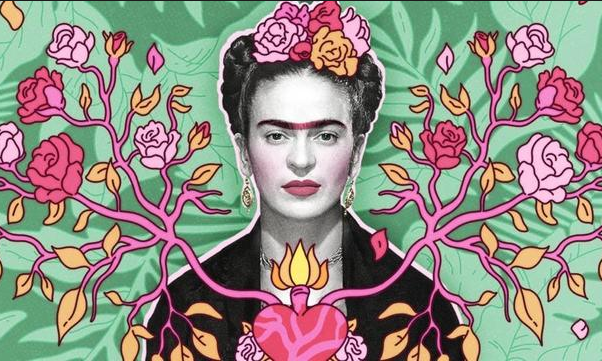 What I find inspring about Frida, a woman known for her self portraits that in a world where we strive for perfection here is a woman with so many “imperfections” find the strength and beauty to celebrate them. And now I celebrate you Frida.